Try balancing a brick on the eraser part of your pencil. That, according to some, is the equivalent of our goal in a recent job. Thanks to our great crew and experience in moving heavy equipment, the result was another successful project. 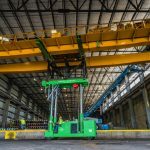 Stationary overhead or bridge cranes are among the heaviest pieces of equipment in most industrial environments. They’re often used in manufacturing contexts, handling heavy materials that more mobile units cannot accommodate. Moving them for maintenance, as a result, is a major undertaking. Fortunately, when one customer came calling, our crew was well prepared for the job. 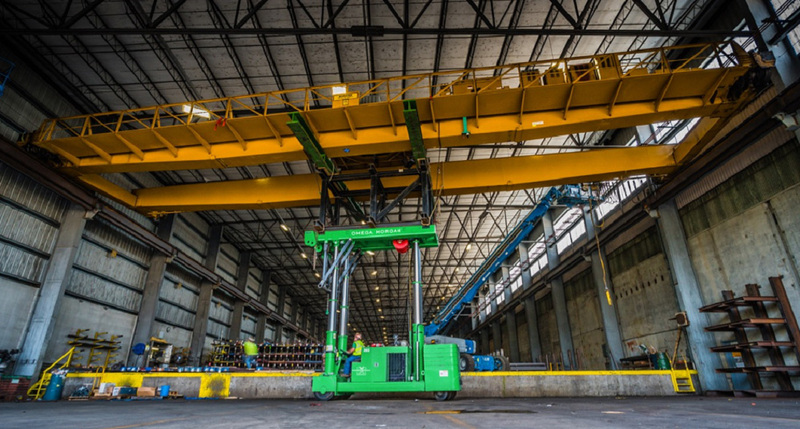 For this project, one of our Oregon Machinery Moving crews was tasked with a major undertaking. The bridge crane to be moved was 90 feet long, 26 feet wide, and weighed 55 tons. The customer needed to perform maintenance on the equipment, and asked us to move the unit from its current spot 29 feet above ground level to staging. More specifically, we needed to lift, rotate, lower, and stage the crane for optimum accessibility and ease of maintenance. Once maintenance was complete, the expectation was to put the crane back in its place for successful and safe operations. Given the core importance of this type of unit in the steel fabrication industry, precision was as important as the raw power needed to move such heavy equipment. Our team, thanks to its experience in moving both bulk and weight, was up to the task. From the moment we took on this project, we knew that our Omega Morgan Trilifter was the right tool for success. We’ve used it successfully in other machinery moving projects, and this was another worthy challenge to test its mettle. In this case, we used our three largest lifts at once in order to lower the bridge crane, and raise it up again after successful maintenance. The 29 foot height above ground required us to think creatively. We set up cribbing on our Trilifter, which allowed it to more easily reach the bridge crane. The cribbing also helped to position our lifting points directly in the center of the unit. This allowed us to distribute the weight of the crane evenly, a crucial consideration with equipment at this weight. Moving equipment of this size tends to be more than a simple lift job. The same was true in this case. Because the bridge crane spanned the entire building, our crew needed to rotate it so that we could have enough room to lower it to staging. As expected, everything went smoothly, including the final move back to its original position on new rails. 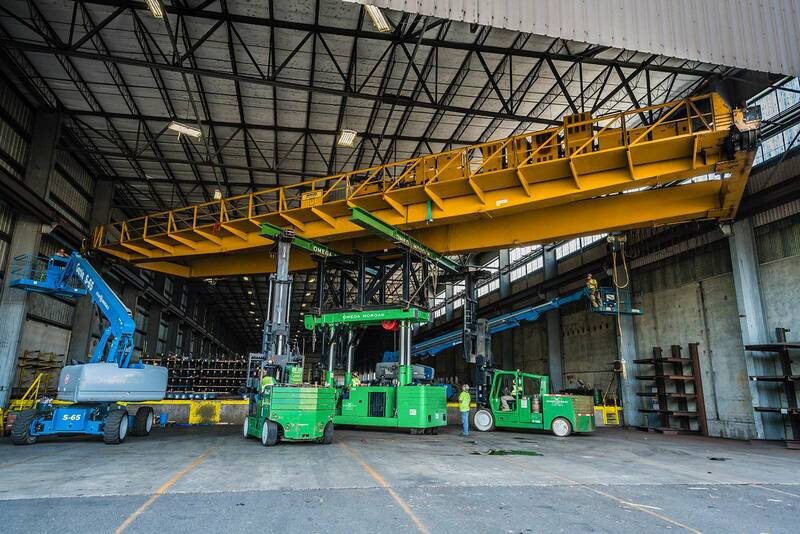 Lifting a 55-ton crane with precision requires experience and expertise. Any mistake in weight distribution or the rotation could have led to significant property damage and personal harm. Our team ensured that neither would be a problem, bringing the project to conclusion smoothly and without any issues. The result was another satisfied customer in the steel fabrication industry. 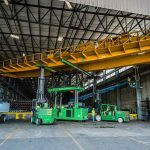 Our Oregon Machinery Moving crew performed the job on time, on budget, and exactly as required. The factory was able to perform required maintenance, ensuring quality and safe work in the facility for the foreseeable future.